In the 1960s a new practical, functional site for the science faculties of Groningen University was built to the north-west of the city centre. Besides faculty buildings it includes some higher professional education institutions and a sports complex. 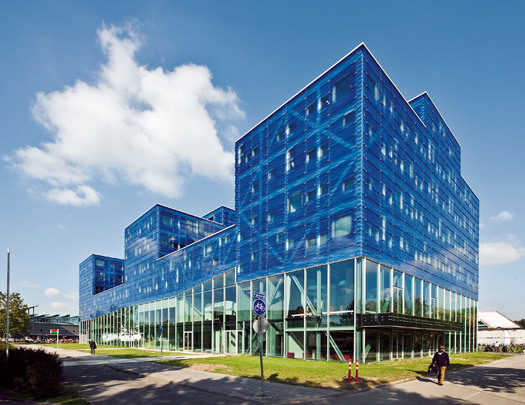 West 8, entrusted with revitalizing the university's Zernike Campus, sought to make it an open green landscape dotted with autonomous buildings of distinction. The Faculty of Mathematics and Natural Sciences (Bernoulliborg) has a steel structure, visible through the blue glazing of the facade, in the interests of flexibility and the variable programme of studies. Three storeys of office space occupy a comb-like structure atop a three-storey basement. The comb-shape derives in part from the position of the two atria and three large lecture halls. A restaurant, a library and study areas are among the general facilities on the two lowest levels. The second floor is mainly given over to practicals, colloquium rooms and reading rooms.